ESA INFO 14-2003. This is clearly Europe's time for interplanetary exploration. 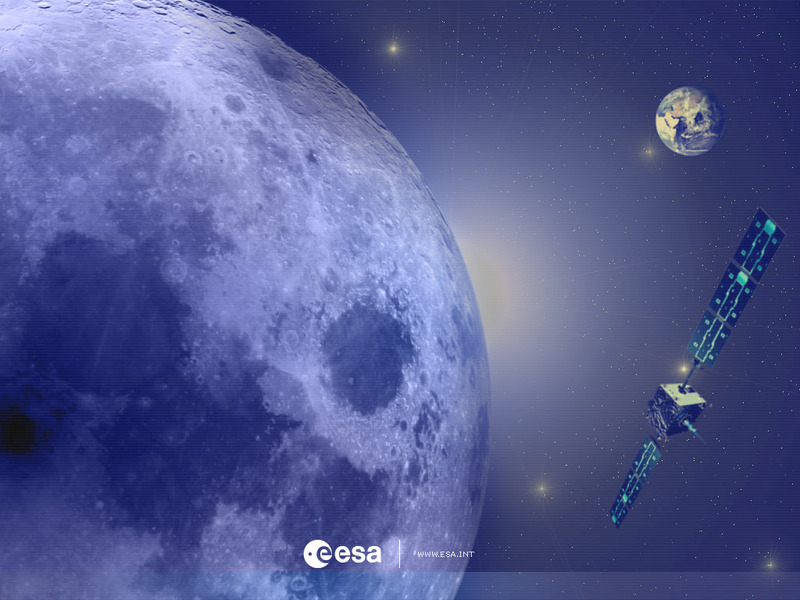 Having sent the first European mission to Mars, ESA is about to launch its first probe to the Moon. It is called SMART-1 and its goals are both technological and scientific. It is the first of a series of 'Small Missions for Advanced Research in Technology'. On the one hand, SMART-1 will test new state-of-the art instruments and techniques essential to ambitious future interplanetary missions, such as a solar-electric primary propulsion system. On the other, SMART-1 will answer pending scientific questions, addressing key issues such as the Moon's formation, its precise mineralogical composition, and the presence and quantity of water. These data will help scientists to understand the Earth-Moon system and Earth-like planets, and will also provide invaluable information when considering a long-lasting human presence on the Moon. On 15 July 2003, SMART 1 was shipped to the European launch base in Kourou, French Guiana, where it is being prepared for its launch, due to take place on an Ariane-5 rocket on 29 August 2003 (Central European Summer Time). For the first time, SMART-1 will combine the power obtained by solar-electric propulsion - never used before by Europe as a main propulsion system - with lunar gravity. It will not follow a direct path to cross the 400 000 kilometres distance between the Earth and the Moon. Instead, from an elliptical orbit around the Earth where it is placed by the rocket, SMART-1 will gradually expand the orbit in a spiral pathway that will bring it closer to the Moon every month. Finally, the Moon’s gravitational field will capture the spacecraft. SMART-1 will not land on the Moon, but will make its observations from orbit, obtaining a global view. When it reaches its destination, in December 2004, it will enter orbit around the Moon and make measurements for a period of six months possibly extended to one year. So, there are many unsolved questions about the Moon, even though six NASA Apollo missions and three unmanned Soviet spacecraft have landed on it and brought back rock samples. The far side of the Moon --the one that never faces Earth-- and the polar regions remain fairly unexplored. The existence of water on the Moon has also never been confirmed, although two orbiters in the 1990s found indirect evidence. We are not even sure how the Moon was formed. According to the most accepted theory, 4500 million years ago an asteroid the size of Mars collided with our planet, and the vapourised debris that went into space condensed to form the Moon. SMART-1 will map the Moon's topography, as well as the surface distribution of minerals such as pyroxenes, olivines, and feldspars. Also, an X-ray detector will identify key chemical elements in the lunar surface. These data will allow scientists to reconstruct the geological evolution of the Moon, and to search for traces of the impact with the giant asteroid. If the collision theory is right, the Moon should contain less iron than the Earth, in proportion to lighter elements such as magnesium and aluminium. By gauging the relative amounts of chemical elements comprehensively for the very first time, SMART-1 can make a significant contribution in resolving this issue. As for water, if it exists, it must be in the form of ice in places always hidden from the Sun. In such places, the temperature will never rise above -170ºC. Dark places like that could exist in the bottoms of small craters in the polar regions. Peering into these craters is maybe the trickiest task that the SMART-1 scientists have set themselves. They will look for the infrared signature of water- ice. It will be difficult because no direct light falls in those areas, but rays from nearby crater rims, catching the sunshine, may light the ice sufficiently for SMART-1 instruments to see it. Future scientific missions will greatly profit from the technologies being tested on SMART-1. Solar-electric primary propulsion is a new propulsion technique based on so-called 'ion engines' that feed on electricity derived from solar panels. It is a technique that has only ever been used once before. These engines provide a very gentle thrust, but they work for years while conventional, more powerful chemical rockets burn for only a few minutes. Ion engines offer key advantages. They need considerably less propellant than chemical propulsion, which means less weight at launch and more mass available for scientific instruments and payload. Ion engines open the door to truly deep space exploration. They slash the time for interplanetary flight: although they provide less thrust they can last for years. The ion tortoise will therefore eventually overtake the chemical hare. Moreover, another application of the gentle thrust provided by electric propulsion allows very accurate spacecraft attitude control, a skill that will be useful for scientific missions that require highly precise and undisturbed pointing. Future ESA science missions will rely on ion engines. SMART-1 will also test new miniaturisation techniques that save space and economise on mass: in space, less mass per instrument enables scientists to have more instruments on board, so more science. The SMART-1 payload consists of a dozen technological and scientific investigations performed by seven instruments weighing only 19 kilograms in total. For example, the X-ray telescope D-CIXS, consists of a cube just 15 centimetres wide and weighing less than 5 kilograms. The ultra-compact electronic camera, AMIE, weighs no more than an amateur’s camera. New navigation and space-communication techniques will also be tested. An experiment called OBAN, based on images from the miniature camera AMIE and the star trackers, is the first step towards future 'autonomous' spacecraft. In a not-too-distant future, scientific satellites will be able to 'find their way' with a minimum of ground control, just by using stars and other celestial objects to guide themselves along predefined paths. As for communications, engineers need to develop new and efficient ways to communicate with Earth from deep space, for interplanetary missions that are long or go far. SMART-1 will test both very short radio waves (called Ka band, with the instrument KaTE) and a laser experiment to try to communicate with the Earth using a laser beam, instead of traditional radio frequencies. ESA already has laser links with telecommunications satellites from an optical ground station on Tenerife, in Spain’s Canary Islands. Aiming the beam becomes much more difficult if, like SMART-1, the spacecraft is far away and moving rapidly. Scientists hope that the on-board camera AMIE will see Tenerife aglow with laser light.